Creation: Appeared Oct 1935 (CTB) running on Lee St south to 10th St, and first explicitly on the 1944 official map. This is the only VA 298. 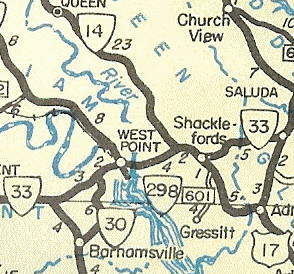 Adjustments: In Sept 1937 (CTB), VA 298 was extended west to its current ending. Posting: Very well posted; 6 cutouts remained as of October 2005 - 5th and Lee and also 5th and Main. As of 2014 only the 5th and Main cutouts remain. Error SR 298 shields existed on VA 33 briefly during 2007-08. Comment: VA 298 is on every official map since 1944. You'd think one time VA 296 could get some recognition. How did West Point get 2 useless town routes? Mapmikey first drove VA 296-298 in October 2005. They really are useless routes. Main St. through the older part of West Point is SR 1129 and if any road should be in the primary system it would be this one. 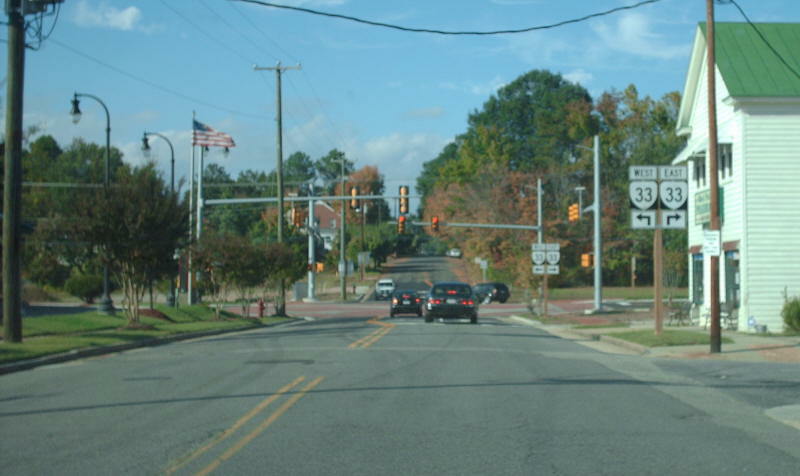 The roads on 296-298 are residential and without lines except right at their VA 33 endpoints.